Salina — The chimes of Sacred Heart Cathedral pealed out “For the Beauty of the Earth” as the newly ordained Father Luke Thielen gave blessings and greeted friends and family following his June 4 ordination. Bishop Edward Weisenburger encouraged Father Thielen to look for “mustard seeds” of faith throughout the priesthood. The bishop said every priest treasures those moments of success. He said humility is an essential part of the priesthood. In attendance were priests of the diocese, as well as Father Jason Wallace, vice rector of St. John Vianney Theological Seminary in Denver and Father Albert Bruecken, O.S.B. from Conception Seminary College. Friends from the seminary and seminarians for the Diocese of Salina were also present. Upon completing the rite of ordination, Father Thielen was vested by Carmelite Father James Thomas, pastor at Sacred Heart, his home parish. The dates of his ordination were special — Father Thielen was ordained to the priesthood on the feast of the Immaculate Heart of Mary. His diaconate ordination was on the eve of Divine Mercy Sunday. “It doesn’t happen too often that you’re ordained a deacon the eve of the solemnity of Jesus and priest on an important Marian feast day,” he said. For Father Thielen, his first full day as a priest on Sunday, June 5 was a celebration of new beginnings and 60 years of service. He celebrated his first Mass at Sacred Heart Parish in Park, where he grew up. “Saying Mass was surreal,” Father Thielen said. “I had to catch myself because I was listening to the concelebrant behind me. I was anticipating following their lead, then I had to remind myself that I’m the one setting the pace. Following first Mass celebrations, Father Thielen headed to Collyer to celebrate the 60th anniversary of priesthood for Father Basil Torrez at St. Michael Parish in Collyer. Even though Father Thielen’s formal assignment begins June 30, he said he is booked every weekend until then. Travels will include filling in around the diocese for other priests, visiting family in Minnesota, traveling to Oklahoma City for a classmate’s ordination and hearing confessions at Prayer and Action. “There’s no rest for the weary,” he quipped. Father Thielen is assigned parochial vicar of St. Mary Queen of the Universe Parish in Salina and St. Patrick Parish in Gypsum. He will reside with Father Kevin Weber, also a priest whose home parish is in Park. 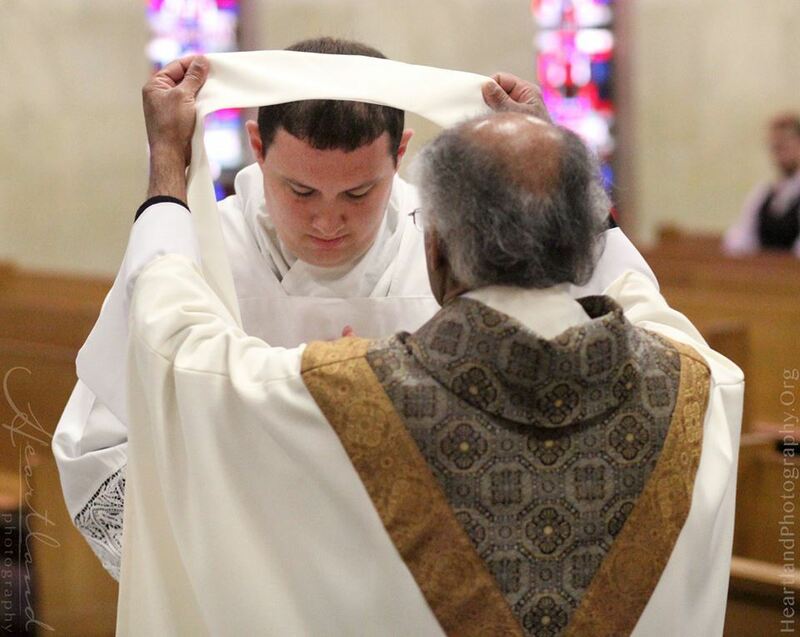 Salina — Deacon Luke Thielen will become Salina’s newest priest when he is ordained by Bishop Edward Weisenburger on June 4 at Sacred Heart Cathedral. The ordination Mass begins at 10 a.m. with a reception immediately following in the Hall of Bishops. Both are open to all. Deacon Thielen, 28, is the son of Tom and Esther Thielen of Quinter. He graduated from Quinter Junior-Senior High School and attended Tabor College in Hillsboro for two years before transferring to Conception Seminary College in Conception, Mo. He recently completed his studies at Saint John Vianney Theological Seminary in Denver. During his time in Denver, he has worked at several parishes. Deacon Thielen was a member of the Totus Tuus summer catechism program for five years and was a member of the Prayer and Action team in 2012 during his seminary years. Prior to entering the seminary, he was a counselor at CYO camp in 2005, 2006 and 2007. Deacon Thielen also spent a pastoral year at Sacred Heart Parish in Colby. His assignment as a new priest will be announced following the ordination. The new Father Thielen will celebrate his first Mass at 10 a.m. Sunday, June 5, at Sacred Heart Church in Park. Park —When it came time for Deacon Luke Thielen to find a chalice to use upon his ordination to the priesthood, he didn’t have to look far. In fact, the chalice he will use was nestled in a cupboard of his home parish for many years. When he celebrates his First Mass June 5, Deacon Thielen will use a chalice from his home parish, Sacred Heart, in Park. He and his mother, Esther, found the chalice by happenstance one day before Mass in the sacristy at Sacred Heart Church in Park. The parish archivist, Janet Kaiser, searched for the origins of the chalice. The family went through the parish council at Sacred Heart, receiving permission for Deacon Thielen to be given the chalice for personal use. Upon being given permission to have the chalice, the Thielen family sent it to Gerkens Religious Supplies in Denver to be refurbished. “They polished it and re-plated the inside of the cup with gold,” Deacon Thielen said, explaining that the interior of the chalice must be a precious metal because it touches the precious blood. The connection to home via the chalice will be a special one.